Every so often, I like to write about something really boneheaded that I did. This is so that you can learn from my mistakes, and also so that you can see that being organized is challenging even for professional organizers. Thus, the tale of the ballet flats. 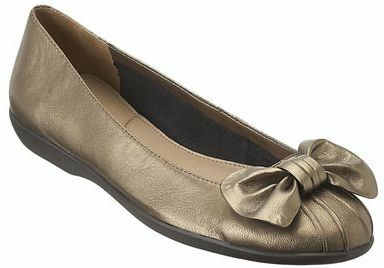 Ever since ballet flats became popular a few years ago, I’ve wanted a pair. This was completely unrealistic, as I’m a difficult fit for shoes, and I hate wearing shoes without socks, except for sandals. Nevertheless, I dreamed of looking dainty in a pair of ballet flats. MISTAKE NUMBER ONE: Longing for something that does not match your lifestyle. For you men out there who have no idea of what ballet flats are, here is a photo of a ballet flat. As a matter of fact, this is a photo from the Easy Spirit website of the very ballet flats that I purchased over the summer. (Isn’t it adorable?) Easy Spirit is just a couple of blocks from my home, and as I passed the store, I saw a SALE sign in the window. I happened to be in that rare state where I wasn’t expected anywhere, was not carrying anything, and did not have my dog with me. So I went in. MISTAKE NUMBER TWO: Allowing a SALE sign to lure you into a store that you had no intention of visiting. I made sure that they were returnable (yes, within 30 days) , so that I could break them in at home and then take them back if they didn’t feel good. Within the first week, it became clear that these shoes were not as comfortable as they had seemed in the store. Rather than accept that, I went to the drug store and bought some peds to see if that would help. MISTAKE NUMBER THREE: Throwing good money after bad. I continue to sporadically break them in, keeping the 30-day return limit in the back of my mind, but never feeling like I was ready to take them for a spin. Even after the 30 days had elapsed (my bad), I didn’t wear them. I was in complete denial. MISTAKE NUMBER FOUR: Getting stuck with an item simply because it’s too late to return it. Finally, nearly two months after I bought them, I took them on their first voyage . . . and their last. They didn’t get any more comfortable wearing them outdoors (and on the subway) than they did at home. I vowed not to wear them again. But what should I do with them now? Donate them? Sell them on eBay? Sticking them up in the back of the closet and trying to forget about them was just not an option. They had to GO! The answer presented itself two days later when a younger, hipper friend visited us. I suddenly remembered that she and I wore the same shoe size. “Do you like ballet flats?” I asked. She did. She wore them for the rest of the evening, and I’m happy to say she took them home with her. So the story had a happy ending – for both of us! I got the offending shoes out of my life, and she got a brand new pair of shoes for nothing. I have a feeling that a lot of the stuff cluttering up our homes got there because we bought something we thought we would like and then never took action when we realized that the purchase was a mistake. The easiest way to avoid this is to not let things into our homes in the first place. I hope you learned something from this cautionary tale. I know I did. Great story! May I share it on Facebook? So glad you enjoyed it! Yes, you may share it on Facebook, as you include my name and a link to my website, http://www.organizinggoddess.net.